Hi guys, here I am giving you the review of best online cloud invoicing, accounting and CRM software for freelancers and SMBs. In this review I will tell you why you should use TopNotepad for your Invoicing, Accounting, and CRM need. Here in this review I will explain Best features of TopNotepad software. I am also giving you the review about user interface and usability of TopNotepad, So that you can easily understand how cool is the user interface of TopNotepad is. I will also tell you why TopNotepad is best as compared to Freshbooks.com & Xero.com. 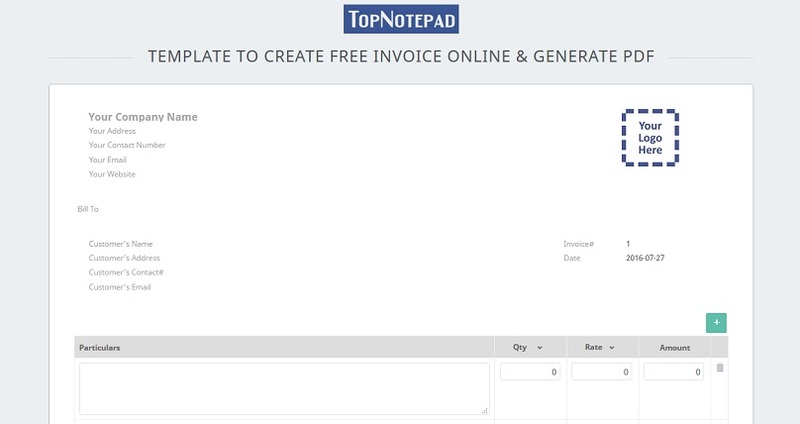 The first feature of TopNotepad i would like to share is, Invoicing and Billing. When you logged in to your account, you will find an Invoices Manager section under which you will find all the below options for invoice management. The software is very handy to use, and you can use it as do it yourself tool. At the top right section, you will find Add Product button under Products page. When you click on it, you will be prompted with a form, and after filling the form, it will come under products page in tabular form. Here you can compare other products, can track the available units, and you can also set the reorder level. Similarly, you can add clients, can make invoices and estimates just by clicking ADD button present at the top right section of the webpage. 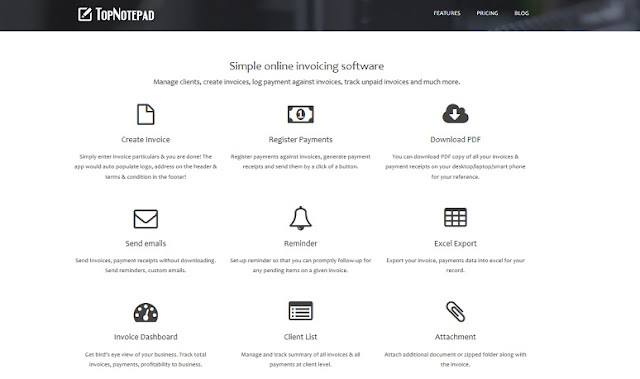 Last is Invoice Dashboard, here you will find a handy report about all of your invoices, payments and profits. This is one of the best feature of TopNotepad because you can track everything at the same place. While on another invoice management sites you will miss this feature. So here TopNotepad wins in Better invoice management. For freelancers and SMBs, expense management is a must. If you want to grow, you have to track all of your expenses. 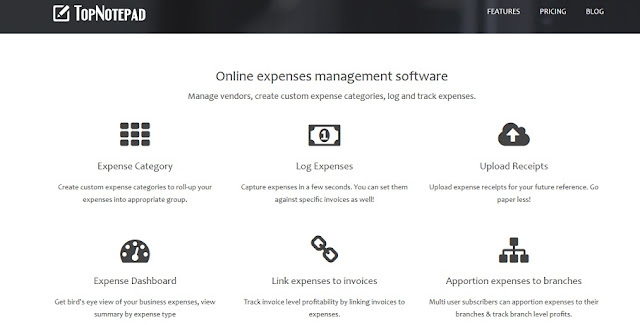 Here the 2nd best feature is Expense management. You will find the 5 below options Under Expense Manager Setting. You can add Vendors by clicking on the ADD vendors button at the top right section of the webpage. After adding Vendor you can add your expenses with vendor name, expense category, along with attachments, so that you can easily read the expenses in future. Now in the categories section, you will find 7 by default categories, you have the option to delete old categories and you can also add new ones. At last you will find Expense Dashboard, where you will get summarize data of your expenses along with the expense categories view. This report section makes TopNotepad best In expense manager category. 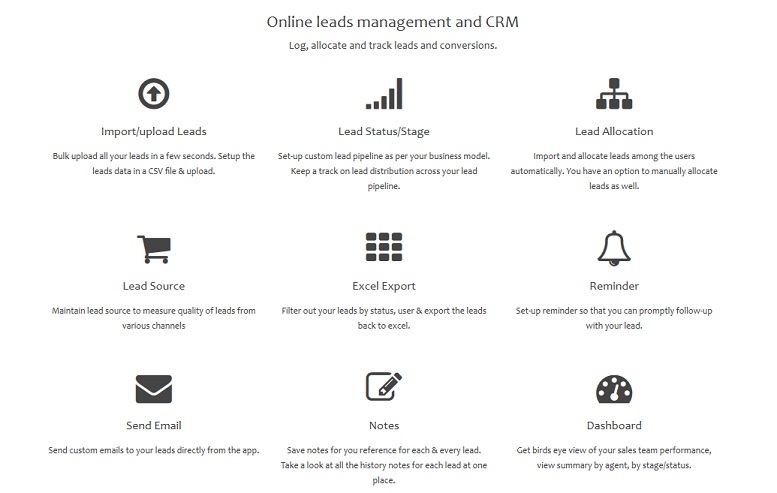 Every business needs a tool to manage leads. Managing leads are easy if your business is small, but with time it will grow larger and larger and hence you will get lots of leads which are very hard to maintain without a proper lead management software. The solution to manage huge number of leads is a CRM software, that are known to increase conversion rates, if used properly. So, ultimately if you want to grow your business, you need a lead manager software which is a part of CRM software. Here Lead manager of TopNotepad will do the job and will give you the below options. 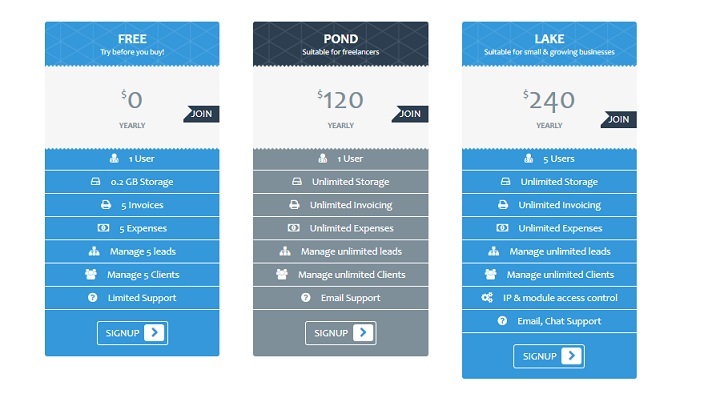 At leads, you can add your leads, just click on add leads Fill the customer's details, save the details and send an email to your customer who is interested in your product. After this, you can add notes to your lead, you can also set the status of your leads. By default, you have 6 different types of statuses like, Fresh lead, contact, converted etc, and the best part is that you can add your own new statuses. The Final option is Leads dashboard, here you will find a small report about your leads sorted by statuses. If you are doing transactions, then surely you will need to maintain your accounts. So, the next feature of TopNotepad is Accounting Manager where you can manage your financial transactions in easy way. At TopNotepad You will get 4 major features of accounting management. You don't need to know much about accounts, you can easily create Profit & Loss statements, you can maintain Cash Book, You can track your Tax report and balance sheet easily with do it yourself interface. With this Software you can generate your balance sheet within few minutes. This is the fully free Template for generating Invoices on the go, just fill all the details in the form and it will generate your invoice within seconds. So far, we have seen many cool features of this software, now we will test its user interface and usability. The Interface is quite good, it is fully responsive and also supports small display screens. It means you can use this website on your mobile easily. The colour scheme is good and you will see every setting on your screen. The usability is very good, See below screenshot, A quick UI helper is telling you how to use this software. It makes it easier to understand how to use this software in a more efficient way. After working on this software for 2 days, i never found this site slow, and the output/reports is generated in a few seconds. So, for user interface and usability, there is no issue so far and is very easy to use. The Pricing is very descent when I compare it with other competitors and found that this software is offering more cool features in half price as compared to others. This Software is available at Free, 10$ and 20$ while other competitors have double to triple prices for no extra feature. For Xero.com you have to pay 20$ minimum for one month, 30$ and 40$ plans are standard and premium ones. For freshbooks.com you have to pay a minimum of 12.95$ for startup pack which is free in TopNotepad. Other packs are 19.95$, 29.95$ and 39.95 depending on your need. So, here the best pricing is of TopNotepad. This is The unique option to switch invoice style from paper to paperless, and you can access your invoices from every place in this world where you have an Internet connection. This Style of the invoicing support clean environment plus it saves your space of storing paper invoices. Now you can store millions of invoices on the server. It is also all-in-one software for freelancer and SME to maintain their Cloud invoicing, accounting and CRM solution at one place. so we can say it's all in one package for freelancer and SME. It is priced free for basic features while premium features are priced halved as compared to its competitors. The user interface and ease of using its fully featured software makes it more powerful among others. So, here i will recommend this software for all of your Cloud invoicing, accounting and CRM solution needs. 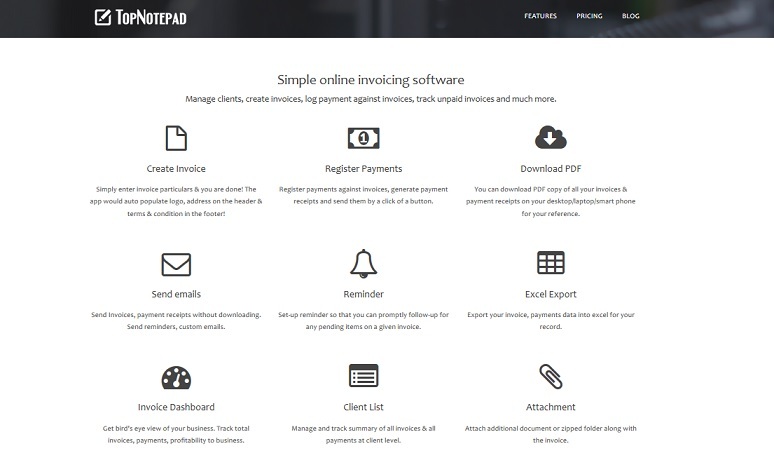 review the tonotepad cloud invoicing accounting nice posts..